Three lucky undergraduate or postgraduate winners will each receive $2000 for their education costs. We offer the Nurses of Tomorrow scholarship as a way to contribute to the creation of strong nurses, nurse leaders and educators who will provide quality patient care and leadership in the future. 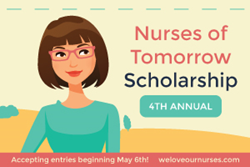 Medical Solutions, the nation’s third-largest travel nurse staffing company, kicks off its fourth annual Nurses of Tomorrow Scholarship Contest May 6, 2015. In honor of Nurses Week, May 6-12, this contest will award three lucky undergraduate or postgraduate nurse scholars each with a $2000 scholarship. This year’s awards are larger than in prior years, thanks to additional sponsorship by Medical Solutions’ RN to BSN Academy partner Nebraska Methodist College. The scholarship competition runs from May 6 (midnight CST) through June 6 (11:59 p.m. CST), 2015. Click here to learn more about and to enter Nurses of Tomorrow, Medical Solutions’ fourth annual Nurses Week Scholarship Competition.